The Homeplace Revisited is the second in a series by William Leverne Smith that began with Back to the Homeplace last year. (Click here to read my review) The series is the ongoing saga of the family of Mildred Bevins, who left her estate to her four children when she died, provided that they agree to return to the homeplace and work the land there for two years. All four children returned, and the first book in the series was all about their experience going back home and adjusting to their new lives. 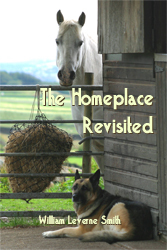 In The Homeplace Revisited, ten years has passed, and the characters who were teens in the previous novel are now grown. This novel is focused on them as they build their careers and their families. Christopher has followed in his father, Carter's, footsteps and become a lawyer. Jennifer is now a veterinarian, and both are looking for love. Matt is also returning to town with his wife and their children to start a new Internet Service Provider (the novel takes place in 1996). They are also dealing with their parents' mortality. Karen's husband, Jason has died, and Carter has been given just six months to live. While it was fun to revisit with the characters, I didn't enjoy this sequel as much as I had hoped. There just wasn't a lot of excitement. A few times it seemed like something interesting would happen, whether it be a conflict between two people or a natural disaster even, but it never really turned into anything. There are a couple love stories that progress throughout the book ~ and lots of business to be taken care of with the Bevins Trust ~ but mostly there's a lot of talking among the characters about their plans and their thoughts, and much of it seemed a bit unnatural. On the one hand it's refreshing to read about good people who are thoughtful and care about one another. On the other hand, a little conflict would have made for a more interesting book. Perhaps I've been reading too many thrillers lately! If you've read Back to the Homeplace, you may enjoy revisiting with the characters and seeing where some of the teens have gone in their lives. There is a third book planned, and the author has some interesting things going on, including a Facebook page, blog and an interactive wiki. You can read about all of that on the author's blog. This review was written based on a copy of The Homeplace Revisited that I received from the author in exchange for an honest review.